My thoughts: My book club chose this book and my immediate thought was “how am I going to get through this book as it is totally outside out of my normal reading genre”. I soon realized this wasn’t going to be a problem as the book quickly grabbed my attention and hung on to the very end. A book set in a very difficult time in World History, namely WW II Nazi occupied France! A beautifully written story of two women’s perspective of war – strength, empowerment, family, redemption, passion! Overall, I am very glad I had the opportunity to read this book as I was taken on an unexpected heart wrenching journey of love, loss, finding one another, renewal, and fighting for what is right! Paris, July 1942: Sarah, a ten-year-old girl, is taken with her parents by the French police as they go door to door arresting Jewish families in the middle of the night. Desperate to protect her younger brother, Sarah locks him in a bedroom cupboard—their secret hiding place—and promises to come back for him as soon as they are released. 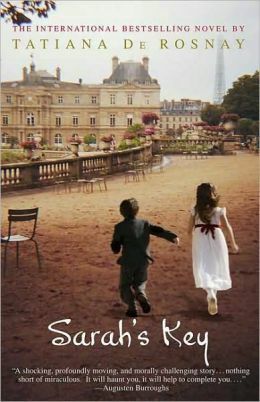 In Sarah’s Key, Tatiana de Rosnay offers up a mesmerizing story in which a tragic past unfolds, the present is torn apart, and the future is irrevocably altered. My thoughts: This was my book club’s October selection . . . and again I am so glad that it was! This is book completely outside of my normal reading genre and I am thankful that my book club chose it, because I really loved it. Without rehashing the entire plot, which you can clearly read from the synopsis above, this is no doubt a very difficult book to read due its primary subject matter of the Holocaust. That in fact is one thing that I loved about it. I loved that this book and it’s topic made me uncomfortable . . . I love that it made me think every step of the way . . . I love that it made me ask myself some questions . . . I love that it made me think deep . . I love that it made me draw parallels between the Holocaust and some of the tragedies we are dealing with today. As I was delving into this book, I found myself asking a lot of questions. Why did the Holocaust happen? How did people think it was alright to do this to human beings? Have we really learned from this event or are we on a lesser scale repeating some of the same mistakes today? This book is written in the style where every chapter jumps back and forth from the past (Sarah’s experience in the holocaust) to present day (the journalist’s journey into Sarah’s story). I normally do not like this style of writing, however in this case I really felt it did the book justice. this style really allowed the reader to get the true juxtaposition and striking difference between the life of a Jewish child during the Holocaust and the life of a journalist. Although certainly not a completely historically accurate account of the French roundup of Jews in Paris in 1942, this book did teach me a great deal and made me explore and research the event even more. As much as I loved the book, I did have a couple of things that I wish were a bit different. I wish the author would have delved more deeply into Sarah’s life rather than focusing so much attention on the journalist and her troubled, strained relationship with her French husband. I feel this focus cheapened the deep emotional experience of the book a bit by turning it almost into a love story rather than an account of the powerful experience. I must say that my book club had one of the best discussions we have ever had on this particular book. We have a number of Jewish individuals attending the book club and I was so blessed that they shared their personal family experiences with the Holocaust and offered their knowledge and life experiences. It really deepened not only the discussion, but my knowledge of the Holocaust. Sarah’s Key touches upon many themes including hope, resilience, good vs. evil, secrets, humanity! All in all, if a person takes one kernel away from this book it is – to never forget! Do yourself a favor and allow yourself to delve into this book and do some thinking. Synopsis (from bn.com): Meet Harold Fry, recently retired. He lives in a small English village with his wife, Maureen, who seems irritated by almost everything he does. Little differentiates one day from the next. Then one morning a letter arrives, addressed to Harold in a shaky scrawl, from a woman he hasn’t heard from in twenty years. Queenie Hennessy is in hospice and is writing to say goodbye. But before Harold mails off a quick reply, a chance encounter convinces him that he absolutely must deliver his message to Queenie in person. In his yachting shoes and light coat, Harold Fry embarks on an urgent quest. Determined to walk six hundred miles to the hospice, Harold believes that as long as he walks, Queenie will live. A novel of charm, humor, and profound insight into the thoughts and feelings we all bury deep within our hearts, The Unlikely Pilgrimage of Harold Fry introduces Rachel Joyce as a wise—and utterly irresistible—storyteller. A huge thank you to my book club for picking this as our September book! They are always bringing new books to my attention that are outside of my normal genre . . . and when it comes to books like “The Unlikely Pilgrimage of Harold Fry”, I am so very glad they point me in new directions. I really enjoyed this book! On the surface, yes it is a story of Harold Fry embarking on a lengthy journey to say goodbye to a former coworker. However, when the reader truly looks under the surface, one will find a story much, much deeper. For me this book really had wonderful deep themes weaving throughout the entire story. It is a book about lost love, righting old wrongs, the power of hope, the power of believing, expectations, redemption, self discovery, self-reflection, relationships, guilt, new beginnings, and on and on and on. The author takes a very simple story and through it takes the reader on their own journey! I felt that the author developed many of the characters well, however there were a few characters whose development felt either unfinished to me (David, Harold/Maureen’s son) or that they were somehow plopped in the story and just left too soon (the group of people Harold meets that join him on his pilgrimage). I felt that there was a great depth to the story and that the author truly exemplified the old adage, “it’s not the destination but the journey that matters” through this book! I highly recommend this book! A great fast read with a truly heartwarming story that takes the reader on their own personal journey if they allow that to happen!! Do yourself a favor and give this book a try! Peter Webster is a rookie paramedic when he pulls a young woman out of a car wreck that should have killed her. Sheila Arsenault haunts his thoughts, and despite his misgivings Peter is soon embroiled in an intense love affair—and in Sheila’s troubled world. Eighteen years later, Sheila is long gone and Peter is raising their daughter, Rowan, alone. But Rowan is veering dangerously off course, and for the first time in their quiet life together Peter fears for her future. He seeks out the only person who may be able to help Rowan, although Sheila’s return is sure to unleash all the questions he has carefully been keeping at bay: Why did a mother leave her family? How did the marriage of two people so deeply in love unravel? A story about trespass and forgiveness, secrets and the seismic force of the truth, Rescue is a masterful portrayal of a family trying to understand its fractured past and begin again. My thoughts: This book feel a bit flat for me. It was ok but certainly not fantastic in my opinion. This is the first book that I read by Anita Shreve as my book club chose it for our July read and I’m not sure this book is a true representation of how great Anita Shreve can be from what I’ve heard and read. This book is an extremely fast read, no doubt about that. However, in term of substance, it just felt lacking. And don’t get me started on the end. Not to spoil the book for anyone, but it just felt a little too abrupt and neatly wrapped up with a bow for me at the end. I am sure life could happen this way, but it was too neat and tidy! I will definitely give Anita Shreve a try again in the future, but I hope it gets better than this. If you are looking for a very, very fast beach read or travel read – this would fit the bill. Any suggestions out there for me in terms of what Anita Shreve book would give me a good representation of her writing? My thoughts: I am not exactly sure where to start with this review as I have so many thoughts and things to say about this particular book. I really, really try to find something positive in all of the books I read, but I must say I am struggling to find that with “The Silver Linings Playbook”. As a disclaimer, I have not seen the movie yet (which I have read is far better than the book) an am simply reviewing the book. My book club chose this as our May book because of all buzz that was created by the movie winning a number of Oscars. I, for one, was excited to read it as it dealt with the topic of mental illness. First of all (and I know his diagnosis was very different in the movie), to me the main character didn’t even have a mental illness in the book but rather a Traumatic Brain Injury (TBI) based on the description of what happened to him in the book. TBI and mental illness – not the same, so this bugged me. Then the synopsis said he was in a “mental institution”, the book actually says “neural institution” which suggests to me more neurorehab that would go with the TBI. Ok, ok, I know this is super nitpicky but it bugged me. As a music therapist and counselor I have the opportunity to work with individuals with mental illness and the topic holds a special place in my heart. Now, I don’t want to get all up on my soap box of “I’m a counselor and I know everything about mental illness”, but I really do think this book’s overall portrayal of individuals with mental illness really ruined the whole book for me to the point where I couldn’t see beyond it. I thought the book’s portrayal of people with mental illness was just uninformed and simply not accurate. I am sure the author was going for a charming, “Forest Gump-type” character who was a simple thinker and would win the reader’s hearts, but it really missed the mark for me. As I was reading, I just wanted to scream out “People with mental illness are not juvenile, childlike, stupid people who can’t do anything by themselves”. I mean referring to his institution as “the bad place” and his separation from his wife as “apart time”, his mother buys all of his clothes for him and almost literally lays them out for him – come on, he wasn’t incapable and stupid. As I’m sure you can tell, this whole issue really bugged me and in not being able to see beyond it, I missed what was supposed to be charming and heartwarming. I found the rest of the characters in the book rather flat and underdeveloped as well. There could have been a great deal of depth in them and how they interacted with the main character, but it just felt like a really simple book with no plot development and a super simple story. I do understand that the author was writing the book from the perspective and voice of the main character who was more simple and had cognitive/mental health issues (I’m still not sure which), but it really felt like the book was written by a fourth grader. As an avid Green Bay Packer fan, I must say that I did really enjoy the underlying plot of the family really coming together through Philadelphia Eagles football. I really connected with all of the descriptions of the games, the avid fans, the tailgating, etc, so I did find this element of the book rather fun. From reviews that I have read I understand that the movie is very, very different than the book and actually much, much better. It is not often that I say that the movie is better than the book – but I am sincerely hoping this is the case. Having just read the book, I have absolutely no idea how it became an Oscar winning movie. I think that the author owes a huge thank you to the screenwriter who turned a very mediocre book into what I understand is a decent movie. In my effort to come up with at least some positive from my experience with this book, I did come up with a few things. It is a very quick read, so even if I clearly had some issues with it, I was able to get through it in one day. As odd as this sounds, I actually really liked how much I didn’t like this book (WHAT??). What I mean by this is that the book got me thinking, it got me analyzing, and it reminded me how passionate I am about certain topics. Books and reading to me should make a person think and spark a reaction – The Silver Linings Playbook certainly did this for me. I was actually irritated and crabby when I finished reading it, but that is alright. A person doesn’t have to like every book they read, but if that book got the person thinking or sparked an emotional response – mission accomplished. Alright, I believe I have said my peace about this book and it is time to move on! Synopsis (from bn.com): Marriage can be a real killer. Let me begin by saying I didn’t originally plan on reading this book. It had been getting a lot of press, good reviews, and everyone in the world was reading it. I tend to be one of those people who always end up disliking or at least neutral with what other people are raving about (ex. Forest Gump, Oprah books, etc. ), so I avoided it. Then I found this new book club in my area and this was their first book, so I took the plunge! Phew and a plunge it was. In short, read this book simply for the guilty pleasure of joining into a descent of a very pathological mind! Buckle your seatbelt and enjoy the ride! I have read that it is going to be made into a movie . . . I always like the book better and don’t possibly see how they can translate this one, but we will see! 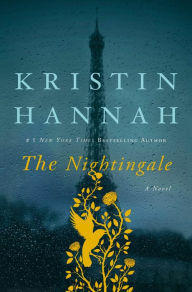 Synopsis (from bn.com): Chicago, 1920: Hadley Richardson is a quiet twenty-eight-year-old who has all but given up on love and happiness—until she meets Ernest Hemingway. Following a whirlwind courtship and wedding, the pair set sail for Paris, where they become the golden couple in a lively and volatile group—the fabled “Lost Generation”—that includes Gertrude Stein, Ezra Pound, and F. Scott Fitzgerald. My thoughts: I can’t believe I have been away from this blog for awhile again – ahhhh. At least it seems as if I have gotten out of my reading slump a bit lately, not totally “cured” but hopefully on my way. Anyway, on to the review . . .
My book club chose this book for our November read. Well, what can I say? I hate being in between and rather apathetic about a book, but unfortunatley this is the case with The Paris Wife. I didn’t hate it, but I also didn’t love it either. This book is set in the early 1920’s and explores the relationship of the great Ernest Hemingway and his first wife, Hadley. I don’t know much about the true life of Hemingway, so perhaps this was a disadvantage for me in reading this book. It was an odd mix of fiction and reality for me. Clearly it was a work of fiction, however there were many aspects of the story that indeed were true I am sure. I just found it odd for me not to know what things actually took place in this relationship and which were in fact the author taking creative liscence. I am not a lover of non-fiction at all, so I guess I would have simply preferred a fictional account. The story chronicles the sometimes tumultuous relationship of Hemingway and Hadley – their travels around the world soaking in the artistic culture of the time in Paris and beyond, meeting famous authors of the day, and trying to navigate a relationship amongst Hemingway’s struggles with the writing process and his shifting moods. There was no doubt in my mind how I felt about Hemingway in this book – I just wanted to scream what a jerk he was the entire time I was reading and kept wondering why Hadley was putting up with the treatment she was receiving. Then I reminded myself that it in fact was a different time in the world and for the time that it was Hadley was rather a progressive, strong individual! I found the book rather boring, flat, and repetitive at times and after about the halfway point just really lost interest! A decent read, but surely nothing I would have picked up on my own outside of my book club!